Stats about Apple are always the starting point for lessons in leadership. No other tech company is as successful as Apple if we look at parameters like profit, environment, responsibility in different areas, innovation, disruptive technology, code of conduct, cult, etc. Different to many others, Steve Jobs, Tim Cook, and all the other excellent employees followed a philosophy. Continuity over decades let this company grew up to the most valuable brands in the world. Apple is a mega brand right in the middle of the epicenter of technology, the Californian Silicon Valley. said Eiji Mori, a Tokyo-based analyst at BCN Inc.
On Wikipedia I found the numbers for sales and income from 1977 to 2013 and added the latest numbers from Apple’s SEC 10-K filing (Annual financial statement). 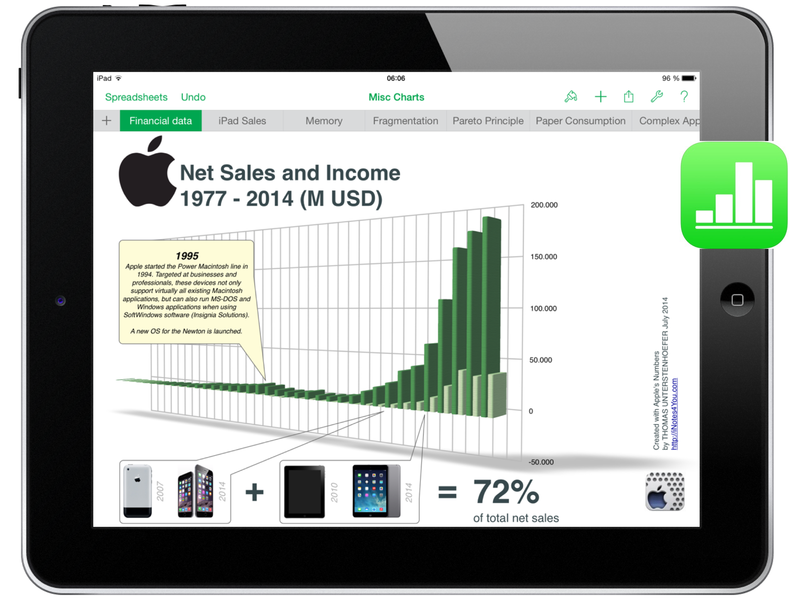 iWork for iOS is an example for the added value Apple gives its customers when buying a mobile device like an iPhone or an iPad. It’s free and the company justifies this decision simply with an improvement of the user experience. It’s just one example for a sophisticated strategy to delight customers.